From the Christmas tree at Rockefeller Centre to the Winter Village in Bryant Park (complete with ice skating rink), New York City from the beginning of December truly is a winter wonderland. Freshly cut trees for sale line the main streets. Hot apple cider flows from holiday market vendors. Falling snow blankets the streets. Enchanting holiday displays fill up the windows at many of the city’s department stores, and there are decorations galore! Hailing from Australia where Christmas Day is usually spent barbequing or in the pool, trying to cool down from the blistering summer sun, there is something particularly lovely about experiencing a wintery, white Christmas. Not only do Christmas Carols actually make sense (yes, chestnuts are roasted on an open fire – who knew), but it really does begin to look and feel a lot like Christmas. The air is cold and crisp, fires crackle, bells ding-a-ling, there are lights everywhere and a delightful pine scent fills the streets. It really is the most wonderful time of the year! Although Nick and I have shared a few frosty Christmases abroad in London, New York certainly takes celebrating the holiday season to a whole new and extremely festive level. One doesn’t even have to venture far to see the holiday sights. 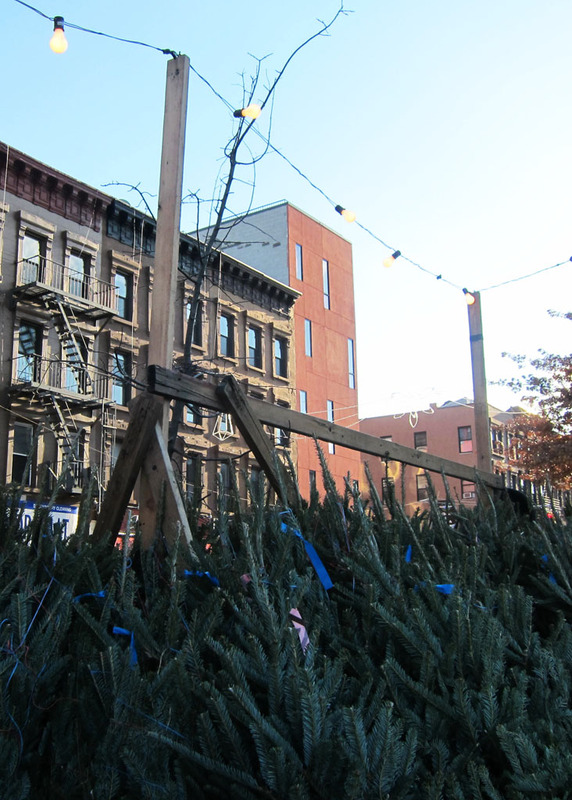 Neighbourhoods like Park Slope, become a festive hub of activity all on their own. 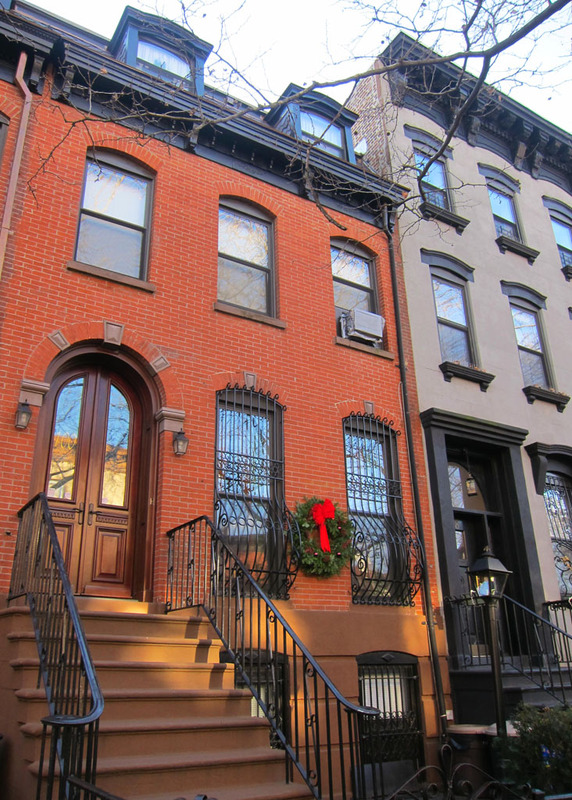 Brownstone stoops are adorned with a twinkling array of lights. 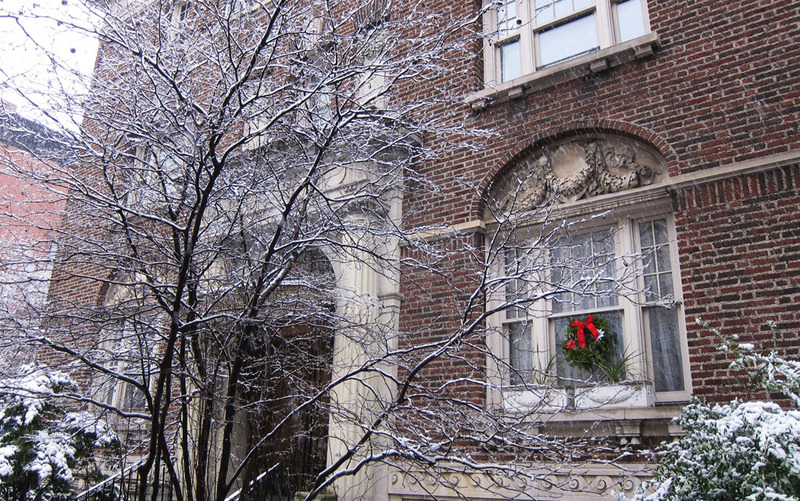 Beautifully decorated Christmas trees stand in bay windows. Strung up ornaments hang above 7th Ave, and ridiculous life-size Christmas inflatables sit in front of peoples homes. With so much to see and do during the festive season, I’ve listed a few things that I believe should not be missed. Come December a handful of ice skating rinks pop up around the city. 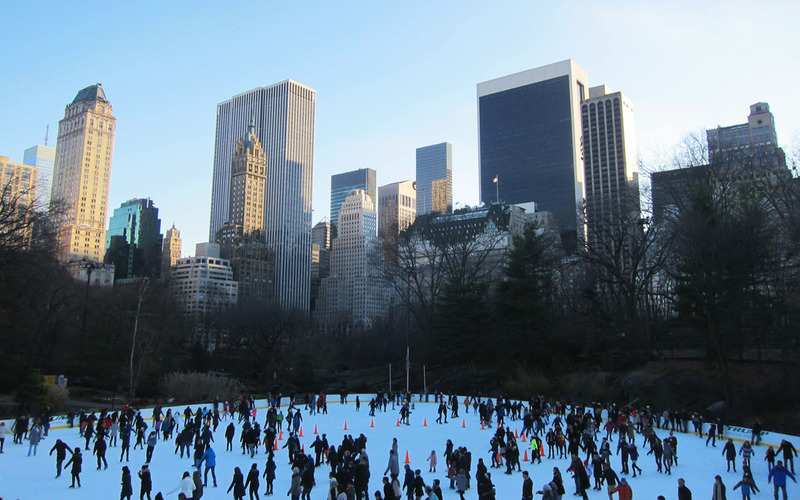 My pick is the Wollman Rink in Central Park. Not only is it bigger than most but it’s also not as busy. Don’t get me wrong, it is still an extremely popular rink to visit – scores of people stream through the gates day and night, but from my experience it feels less crowded and not as hectic as others. Also how can you possibly match the city skyline backdrop? Skate, eat, drink and enjoy the Christmas cheer at this lively holiday market. 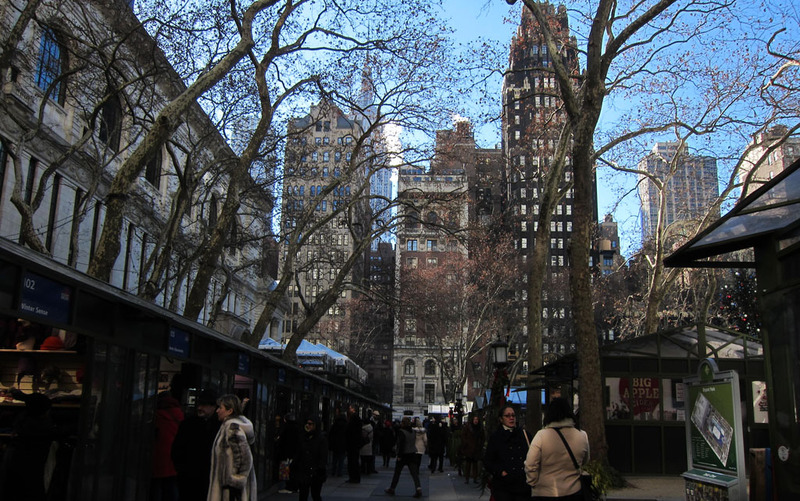 Similar to the Christmas markets in Europe, Bryant Park’s Winter Village is home to a cluster of festively decorated stalls selling a wide range of merchandise from NYC souvenirs to unique handcrafted gifts, as well as hot chocolate, mulled wine and cider. There are plenty of food options too! Furthermore there’s an ice skating rink, pop up restaurant and last but not least a huge sparkling Christmas tree. To avoid the swarming crowds, I suggest visiting during the week. 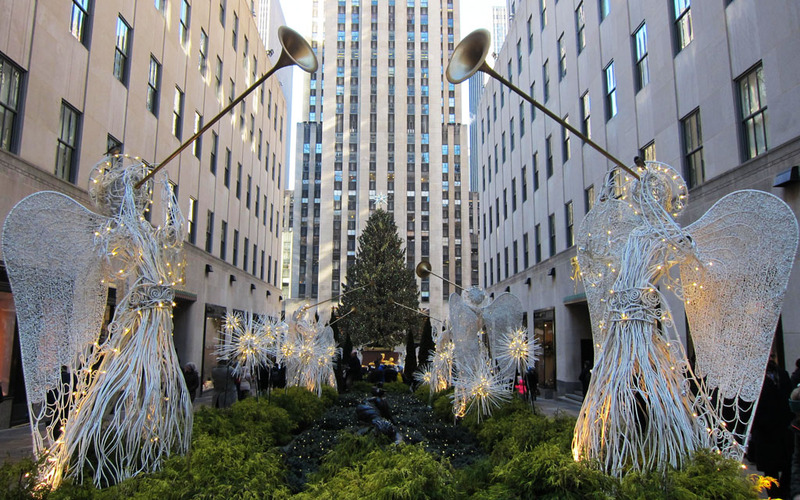 Without a doubt the most iconic New York Christmas image is the Christmas tree at Rockefeller Centre. As such, people travel great distances to catch a glimpse of the enormous Norway Spruce, which stands proudly in the forecourt every year. No matter what time of day, a crowd of people gather at the foot of this famous tree, to simply stare at it in amazement or to line up for the chance to take a spin on the adjoining ice rink. I’m not going to lie, at times the volume of people is absurd and finding room to move is tough. So if you don’t like crowds it’s best to avoid Rockefeller Centre at the weekend. Having said that though, don’t let the swarming crowd put you off, the tree in all it’s sparkling glory is a magical sight to see. I wish I could see more Dannii! Adult fare = $11.25 Mon-Thurs, $18 Fri-Sun. Skate rentals = $8. Locker rental $5. Cash Only.